FinancialForce continues to show strong momentum in the cloud ERP market, and it is building out its product capabilities in interesting ways. At the same time, market competition is heating up, and FinancialForce can no longer lay claim to being the only accounting system provider on the Salesforce platform. In this post, we provide an update on FinancialForce, based on interviews we conducted with its executives at Dreamforce, the annual conference for users of Salesforce.com. We also provide recommendations for buyers considering FinancialForce. FinancialForce.com is a relatively young ERP vendor, founded in 2009 as a joint venture between UNIT4 and Salesforce. In 2013, its acquisitions of Vana Workforce and Less Software expanded FinancialForce from financial systems and professional services automation (PSA) into human capital management (HCM), order processing, inventory control, and cost accounting. As is the case with many cloud ERP vendors, FinancialForce has been moving steadily upmarket. In a small group analyst briefing, CEO Jeremy Roche indicated that average selling price has increased 25% to 30% over the past 12 months. Although he was unwilling to name names, he also reported that its largest customer has over 36,000 users of FinancialForce. A quick look at this year’s winners of FinancialForce customer awards has some big names on it. Multi-Dimensional Accounting. FinancialForce has greatly improved the flexibility of its general ledger. The system now allows a customer to take any FinancialForce object and use it as an extension to the chart of accounts. There is no need to restructure the chart of accounts number. For example, one customer could choose to report profit and loss by customer, another might want to report it by product, and a third might need to report by marketing campaign. Interestingly, in our ERP selection consulting work, we recently saw FinancialForce removed from consideration because it lacked project accounting capabilities. It appears now, however, that these enhancements would have satisfied our client’s requirements. Interoperability of Accounting, PSA and CRM. FinancialForce is emphasizing its ability for users to move seamlessly between its financial system, PSA system, and HCM system. Specifically, the PSA capabilities are now more fully integrated with the human capital management (HCM) functionality that FinancialForce acquired from Vana Workforce in 2013. For example, when FinancialForce PSA forecasts a shortage of a certain type of resource, it can trigger a recruitment effort in the HCM system to hire new employees or retain contractors. Absence management and personal time off are now integrated between the two modules. Finally, the salesforce customer entity is simply the Account object in Salesforce.com, filling out the 360 degree view of the customer that CRM has always promised. User Interface. Leveraging the capabilities of the platform, FinancialForce is upgrading its user interface to more fully leverage the new Lightning capabilities of Salesforce.com. Lightning allows developers to more rapidly build an application user interface that can be deployed across multiple desktop and mobile devices. There are multiple components for things like search bars, charts, related lists and so forth, and developers can also build their own components specific to their applications that they build on the platform. By incorporating Lightning capabilities into the product, the user experience of FinancialForce will more closely match that of Salesforce’s Sales Cloud and other applications. It will also allow joint customers to more easily combine features of each system into one user experience. Embedded Analytics. FinancialForce is working to incorporate Salesforce Wave Analytics into its system to provide a canned set of dashboards. Wave Analytics is the Salesforce.com answer to the need for a business intelligence capability as part of its platform. By making Wave Analytics part of the Salesforce platform, AppExchange partners such as FinancialForce can more easily deploy embedded BI capabilities instead of each of them developing their own from scratch or partnering with a third-party BI systems provider. As we reported last week, Rootstock is also developing dashboards using Wave Analytics. Punch Time App for the Apple Watch. 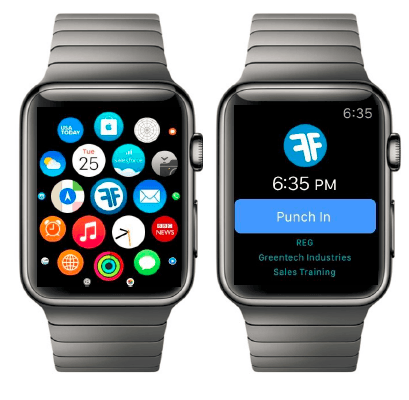 Adding some sizzle to the steak, FinancialForce demonstrated its first app on a smart watch. Integrated with FinancialForce HCM and PSA modules, Punch Time Tracker is used for approvals, time reporting and activity dashboards. Although it only works on the Apple Watch today, FinancialForce is also working on an interface for Android watches as well. These developments point to FinancialForce going beyond core accounting capabilities into something close to a full-blown ERP system. For this reason, last year, FinancialForce branded its system as FinancialForce ERP. But, at some point, we wonder whether the FinancialForce brand itself deserves reconsideration. Kenandy, a cloud ERP provider also on the Salesforce platform originally planned to partner with FinancialForce for its accounting modules. But Kenandy changed its strategy shortly thereafter, and developed its own financial management capabilities. In our post last week, we covered recent developments with Kenandy. Rootstock, another cloud ERP provider on the Salesforce platform, has been partnering with FinancialForce. Although it will continue to do so, it is now also developing its own financial systems for customers that prefer a single vendor. We covered this in our recent post on Rootstock. AscentERP, another such cloud ERP provider, has likewise been partnering with FinancialForce. But in discussions at Dreamforce, its executives told me they have always been offering multiple choices for financial systems and will increasingly do so. Sage recently announced its own new financial system, built natively on the Salesforce platform, dubbed Sage Live. With an enormous worldwide installed base on on-premises customers, Sage could bring serious competition to the market for financials-only systems. Finally, though not built natively on the Salesforce platform, Intacct continues to offer a pure cloud accounting system that integrates well with AppExchange partners on the Salesforce platform. To be fair, FinancialForce executives do not seem particularly worried about increasing competition, and their market momentum appears to back up that attitude. FinancialForce belongs on the short list for any Salesforce.com customer that is looking for an accounting and financial reporting system. Moreover, as FinancialForce grows, it is also becoming an interesting choice for buyers who are not on Salesforce. As it expands its functional footprint, it can be, in some cases, a legitimate choice for a complete ERP system, especially in customer segments where it has had substantial success. These include professional services firms and value-added resellers, which combine product sales and services. In particular, we believe the addition of multidimensional accounting, across any entity in the system, is a welcome development. Prospects should keep in mind, however, that FinancialForce has been experiencing rapid growth and the usual pains that go with it. Hiring continues at a frantic pace, with over 650 employees at seven offices worldwide. In our software selection and vendor evaluation consulting, we have seen signs that the vendor is being stretched by its new deal pipeline. Although this may frustrate prospects interested in kicking the tires, it does mean that FinancialForce is likely to take itself out of opportunities where it does not think it is a good fit. This entry was posted in ERP Selection, HCM Software Selection and tagged AscentERP, Cloud, ERP, ERP Selection, FinancialForce, Intacct, Kenandy, Rootstock, SaaS, Sage Live. Bookmark the permalink.